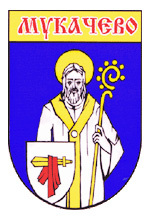 The city of Zakarpattia oblast. Related articles: Mukachevo Castle Palanok. Mukachevo, the second largest city of the Zakarpattia region, is located on the Latorica River, 41 km south-east of Uzhhorod. 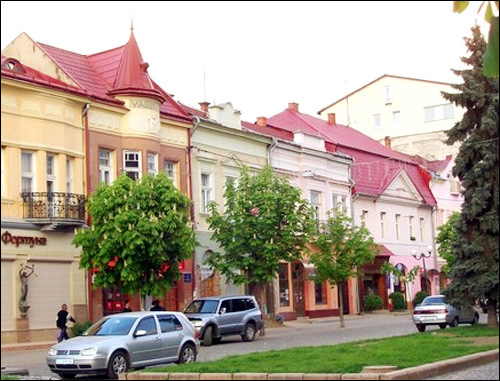 It is the administrative center of the Mukachevo district, an important industrial and cultural center of the region. The population of Mukachevo is about 86,000 (2016), the area - 27 sq. km. The phone code - +380 3131, the postal codes - 89600-89619. Local time in Mukachevo city is April 22, 5:13 am (+2 UTC). 9 November, 2017 / Mukachevo - walk through the town center. 6 May, 2017 / Palanok Castle in Mukacheve. 25 March, 2016 / The Hunting Palace of the Counts Schonborn. 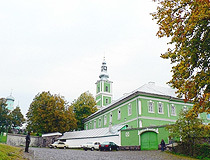 4 October, 2015 / The castle-palace of the Counts Schonborn near Mukachevo. 23 June, 2015 / Let's walk the streets of Mukachevo. The exact date of the founding of Mukachevo is unknown. In the 6th-9th centuries, there were several Slavic settlements here. The first written mention was made in the chronicle of Gesta Hungarorum (The Deeds of the Hungarians) created at the end of the 12th century. It referred to the migration of Hungarian nomadic tribes through the Carpathians in 896-903 and mentioned Mukachevo as a settlement under the name Muncas. It can be assumed that it appeared as a military fortification and settlement of the East Slavic tribe of White Croats in the 870-880s. By 903, the Hungarians captured all major Transcarpathian fortresses including Muncas and settled on this territory. In 1086, after the devastating invasion of the Polovtsians led by Kutec Khan, the Hungarian King Ladislaus I completed construction of a fortress with stone walls on Castle Hill to protect the region from frequent attacks made by the Polovtsians from Galicia. In 1241, Mukachevo was devastated during the invasion of the Mongols led by Batu Khan. Only mountains and forests saved the local population from physical extermination. 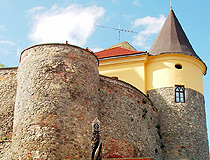 After the Mongols left the area, the Mukachevo Castle was significantly strengthened. In 1281, Prince Leo I of Galicia, who reigned in the Galicia lands, for some time extended his influence on the part of Transcarpathia that included Mukachevo. After the death of the prince in 1301, the settlement was part of the Galicia-Volyn principality. However, in 1321, the settlement was again annexed to Hungary. In 1339, the Mukachevo Castle was expanded, a moat was built around it and on the inner side of the moat a palisade was built (in Hungarian it was called “palank” - hence one of the present names of the castle - the Palanok Castle). 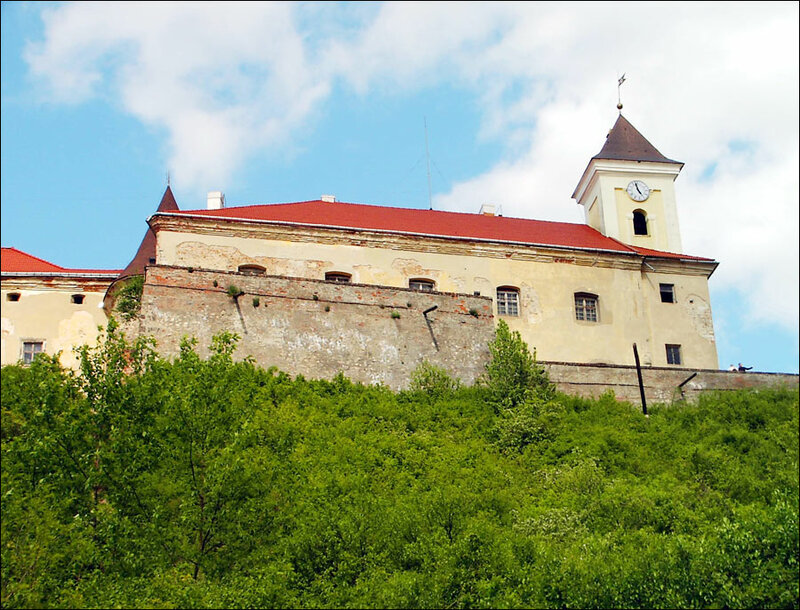 Simultaneously with the strengthening of the role of the Mukachevo Castle, as an important military and strategic point guarding the borders of Hungary in the northeast, the importance of Mukachevo as a settlement located at the crossroads of important trade routes grew too. In 1376, Mukachevo became a town - the first in Transcarpathia, which contributed to its development and rapid transformation into a large trade, economic, and administrative center of the region. From the end of the 14th century, Mukachevo became the center of the principality of the Podolia prince Fedir Koriatovych. In 1396-1414, he significantly increased its importance, promoted the development of trade and crafts, carried out a radical reconstruction of the castle and turned it into a powerful defensive structure. In 1445, Mukachevo received the Magdeburg right. In 1526, after the defeat of Hungary from the Ottoman Turks in the Battle of Mohacs, Mukachevo became the property of the Transylvanian princes (the Turkish vassals). 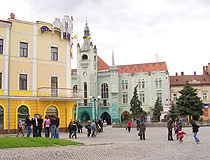 From the middle of the 16th century, Mukachevo and its surroundings became the object of constant clashes between the Habsburgs and the Transylvanian princes. In 1648-1649, the representatives of Hetman Bohdan Khmelnytsky visited Mukachevo and negotiated about joint actions against Poland. In 1656, a treaty of friendship and mutual assistance was signed. In the summer of 1657, the Poles, as revenge for such actions, looted and burned the town and the castle. At the turn of the 17th-18th centuries, Mukachevo was one of the key strongholds of the Hungarian national liberation movement. In 1711, according to the Satmar Peace Treaty, the town passed under the control of the Habsburgs. 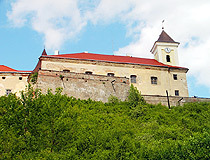 After the fall of the Bastille, Mukachevo Castle became an all-European political prison. Many famous revolutionaries were imprisoned in it, in particular, the national hero of the Greek people Alexander Ypsilantis (1821-1823). In 1848-1849, Transcarpathia supported The Hungarian Revolution of 1848. Residents of the town released the prisoners of the Mukachevo Castle. Volunteer units were formed to fight against Austrian government troops. The uprising was suppressed with the support of Russian troops. In 1870, there were 917 houses in Mukachevo, of which 17 were two-story houses. The population of the town grew from 9,644 people in 1880 to 16,518 people in 1910. In 1886, with the construction of the railway, Mukachevo was connected with Budapest, Kosice, Lviv. In general, life in this region was very difficult, as evidenced by the massive emigration of locals in the US, Canada, countries of Latin America. From 1890 to 1913, about 100,000 people emigrated from Transcarpathia. After the end of the First World War of 1914-1918 and the collapse of the Austro-Hungarian Empire, the situation in the region worsened significantly, which led to revolutionary actions and riots. In 1920, according to The Treaty of Trianon, Mukachevo, like the entire Subcarpathian Rus, became part of Czechoslovakia. In 1938, with the decision of the First Vienna Arbitration, which led to the partitioning of Czechoslovakia, Mukachevo was returned to Hungary, together with the entire territory of Transcarpathia and Uzhhorod. In April 1944, after the occupation of Hungary by the German troops, two ghettos for Jews were created in Mukachevo. In late April - early May 1944, they were liquidated and the prisoners were deported to Auschwitz. The Hungarian Jewish community was the last one in Europe to be subjected to deportation. October 26, 1944, Mukachevo was captured by the Red Army. November 26, 1944, the First Congress of People’s Committees of Transcarpathian Ukraine took place in the town, at which the Manifesto was adopted on the reunification of Transcarpathian Ukraine with Soviet Ukraine as part of the USSR and on leaving the Czechoslovak Republic. June 29, 1945, in Moscow, an agreement was signed between the Soviet Union and the Czechoslovak Republic. A new period began - the Soviet period in the history of Mukachevo and the region. The Soviet authorities began the policy of expulsion of the Hungarian population. During the years of Soviet power, Mukachevo became a significant industrial center. A special road-building brigade for the construction of highways and bridges on the Mukachevo-Lviv direction was formed in the city. From 1970 to 1980, more than 70 kilometers of highways and dozens of bridges were built in difficult mountainous conditions of the Carpathians. 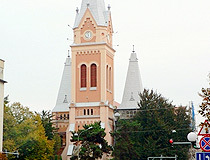 Since 1991, Mukachevo is part of an independent Ukraine. Mukachevo is located in the south-western part of the Zakarpattia region of Ukraine. Due to its very convenient geographical location (40-50 km from the borders with Hungary and Slovakia, and 90-100 km from the borders with Romania and Poland), Mukachevo is an important transport hub of several international highways. The city is crossed by railways: Moscow - Kyiv - Budapest - Belgrade - Rome and Moscow - Kyiv - Bratislava - Prague - Vienna, as well as highways: Kyiv - Budapest - Vienna and Kyiv - Prague. Until recently, two variants of the name of the city were used in the Ukrainian language: Mukacheve and Mukachevo. 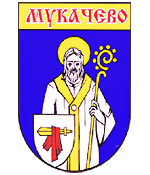 May 23, 2017, the name of the city was officially changed from Mukacheve to Mukachevo. The climate in Mukachevo is moderately continental. The average temperature in January is minus 2.7 degrees Celsius, in July - plus 20 degrees Celsius. According to the 2001 census, the national composition of the population of Mukachevo is the following: Ukrainians (77.13%), Russians (8.97%), Hungarians (8.54%), Germans (1.95%), Romani (1.38%). The main branches of the local economy are production of furniture, sports equipment, electricity, electrical and electronic equipment (Flextronics International Ltd.), agriculture, and food industry. 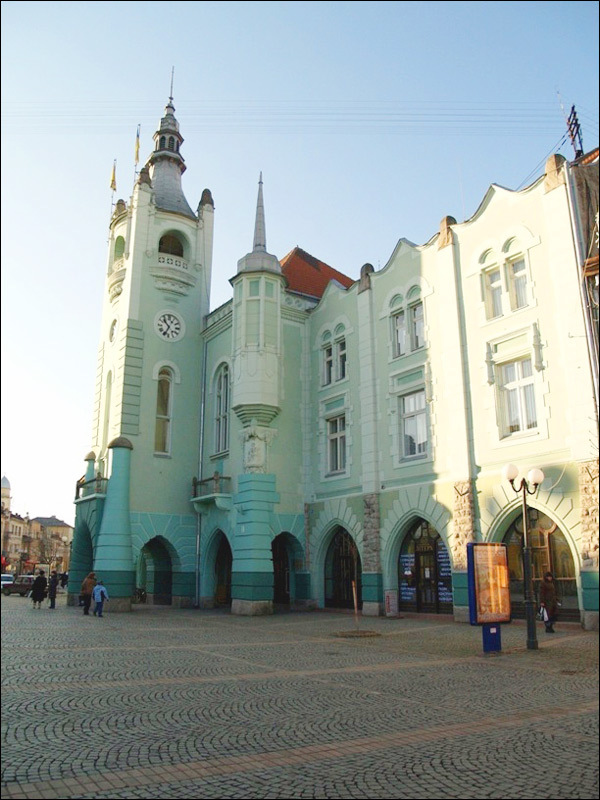 Today, Mukachevo is a relatively large European industrial city, in which it was possible to preserve and restore in its original form the building of the city hall, theater and other objects constructed in the late 19th - early 20th centuries. Here, the architectural heritage of Austria-Hungary and Czechoslovakia has been preserved. The city has a high tourist potential, both for Ukrainian and foreign tourists. Ukrainians are attracted here by the Castle of Palanok, St. Nicholas Convent, and the city center with its paved streets and cozy cafes. Foreign tourists (mainly Hungarians and Slovaks) come here to get acquainted with the historical events that took place in this region in the context of the history of their countries. Local residents mostly rest on the beaches of the Latorica River, as well as in the village of Lisarnya and on the banks of the right tributary of the Latorica River, the Voznitsa River. The City Day of Mukachevo is celebrated on the last Saturday of May. Palanok Castle - an outstanding historical and architectural monument of the 14th-18th centuries, a patrimonial nest of the Transylvanian princes Rakoczi, and the main attraction of Mukachevo. The castle, located in the south-western part of the city, was constructed on a hill (65 meters) in several stages. Since 1993, a historical museum and an art gallery are housed in the castle. There is a coffee house, a wine tasting room, souvenir shops. Kurutsiv Lane. Opening hours: 09:00-18:00. Day off: Monday. 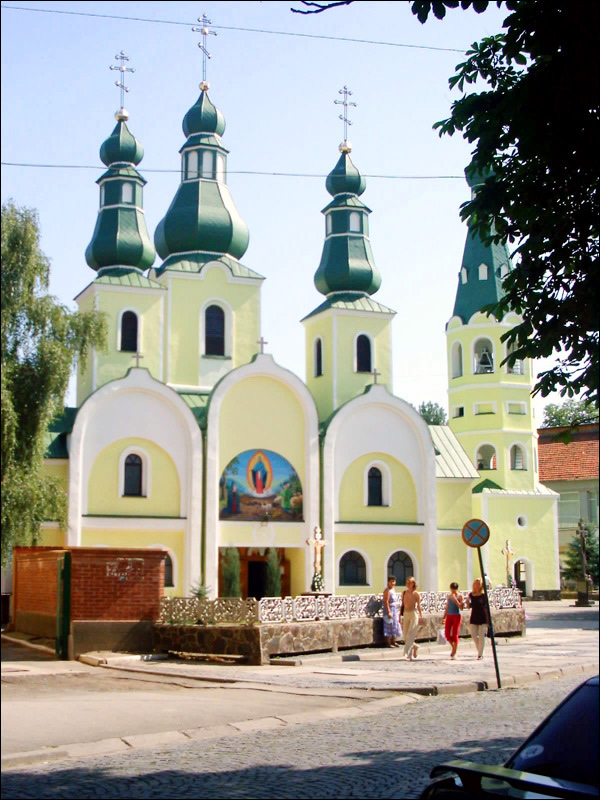 Saint Nicholas Convent - the main Orthodox shrine of Mukachevo. According to one legend, it was founded in the 11h century by the Kyiv monks accompanying Anastasia, the daughter of Yaroslav the Wise, who was married to the Hungarian king. There are preserved caves and a healing spring. It was the residence of bishops in 1491-1772. Stone buildings in the Baroque style were constructed in the 18th-19th centuries. In general, it is a well-kept and beautiful place. Pivnichna Street, 2. Myru Square - a cobbled boulevard, which forms the basis of the pedestrian triangle of the tourist zone in the city center. The dominant feature is the city hall in the Art Nouveau style (1906). At the other end of the square you can see the Cathedral of St. Martin. Also there is a monument to St. Cyril and Methodius here. This is a traditional venue for mass events. St. Martin of Tours Cathedral and Chapel of St. Joseph. 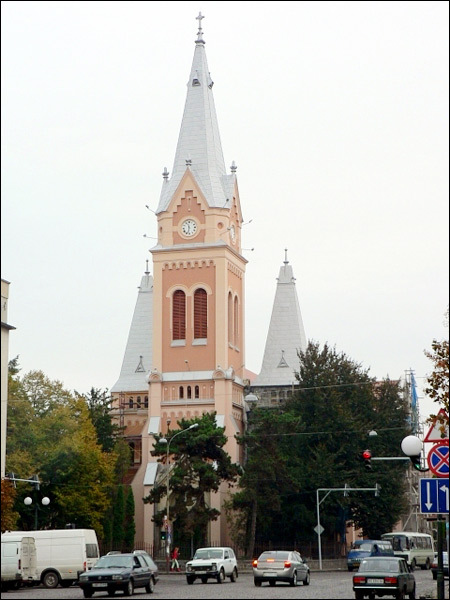 This Catholic cathedral, named after the patron saint of Mukachevo, was built on the site of the old Gothic church in 1904. The only preserved original building is the Gothic Chapel of St. Joseph (the 14th century) with medieval murals and tombstones. Myru Street, 2. Princes Rakoczi Palace (White House) - a monument of palace architecture of the 17th-18th centuries built in a mixed Renaissance and Baroque style, the former family residence of the Transylvanian princes Rakoczi. Originally, the walls of the residence were painted white. Today, the building is occupied by the Children’s Art School. 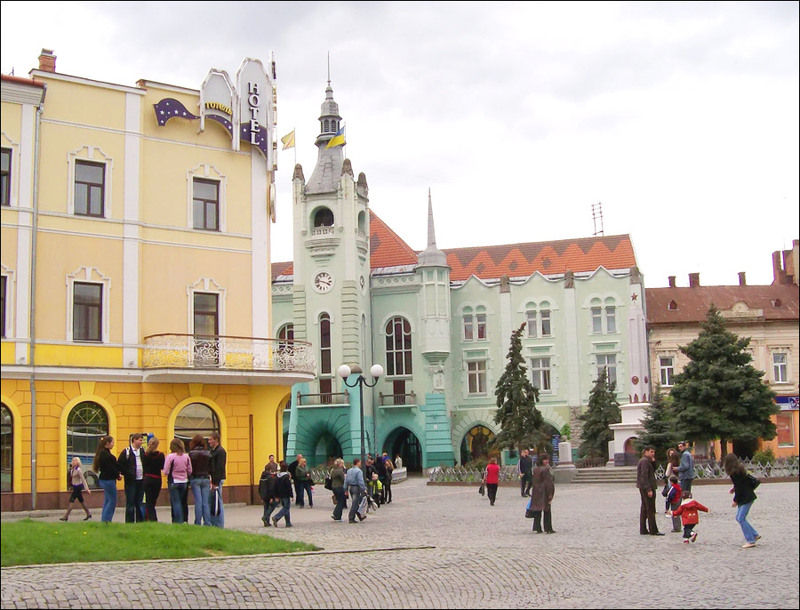 Kyryla i Mefodiia Square. Cathedral of the Pochaiv Icon of the Mother of God. The unusual architecture and beauty of the cathedral, built in the center of the city 1993, attract the attention of the guests of Mukachevo. The facade is made in the form of three large oval arches. Fedorova Street, 7. 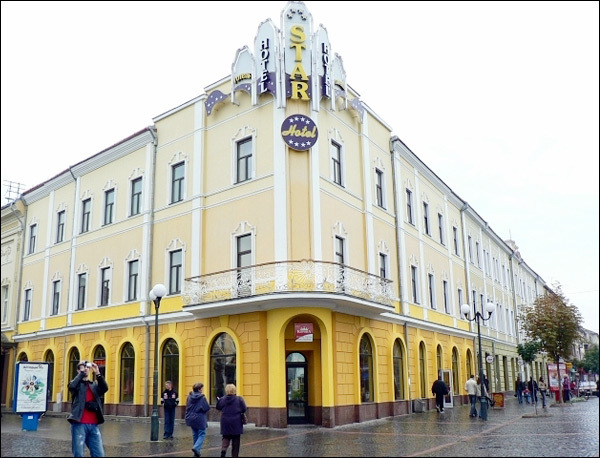 Mukachevo, a relatively small city, has quite a number different accommodation options - dozens of hotels, mini-hotels, guesthouses, and apartments. The following English friendly hotels located in the central part of Mukachevo offer the best level of service according to visitors’ reviews. 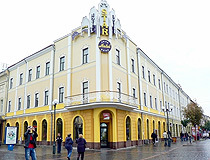 Hotel “Ferdinand” - a new hotel and restaurant complex located on the bank of the Latorica River, about 15 minutes walk along the waterfront to the center of Mukachevo. 9 rooms with air conditioning, free Wi-Fi and parking, family rooms, safe, elevator, tour desk, currency exchange, playground, gift shop, beauty salon, restaurant, bar, pets are not allowed. Universitetska Street 58A. Phone: +380 66 749 8969. Hotel “Star”. 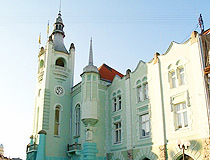 The hotel is located on the central square of Mukachevo, in an Art Nouveau building that once belonged to the Austro-Hungarian dynasty von Schoenborn. From the hotel windows you can see the City Hall and the pedestrian part of the city - the center of cultural life of Mukachevo. 61 rooms with air conditioning, free Wi-Fi and parking, safe, elevator, bar, restaurant, gift shop, shuttle service, pets are not allowed. Kyryla i Mefodiia Square, 10-12. Phone: +380 95 100 0170. Hotel “Velure” - a new hotel located near Mukachevo State University, about 700 meters from the city center. 10 spacious rooms with air conditioning, free Wi-Fi and parking, family rooms, safe, no elevator, bar, restaurant, pets are allowed on request. Universitetska Street, 7A. Phone: +380 66 088 3800. The Police in Mukachevo are hell bent on getting money from "out of towners" and talk about "not working for money, but for helping people." Their outrageous conduct seems to target foreigners and out of town cars. These self-righteous cops are totally out of touch with reality and do not understand that Western men at retirement age are NOT drunk just because they are lively, animated, and happy. Older US/EU citizens are not downtrodden like their Russian ancestry, their own parents and their relatives. * i payed 150 UAH (about €15,-) and that is way to much for a country where average salaries is €150- €200 a month. We visited Ukraine in 2005-2006 for six months. Mukachevo was the prettiest city we visited. The castle has a museum and art gallery in it. For a small fee you can have a guide show you the castle and tell about its history. We had great pizza at the White Parrot.